Conan the Barbarian is a remake that isn’t so much a remake as it is a re-imagining of a well known cult classic. It’s filled with blood and battles, swords and sorcery and violent action right out of the gate. It delivers a new Conan, different in many ways from the old Conan, a new spin on a familiar story, and the opportunity for sequels in the future. One thing this film did better than the original was to give the viewer more of a sense of connection with Conan (Jason Momoa). He was born on the battle field in a traumatic way and we empathized with a child who grew up without a mother and so we understood his anger. 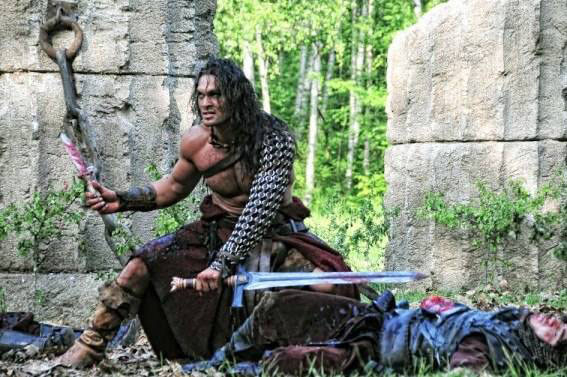 After witnessing the death of his beloved father Conan vows to have vengeance against the men who were responsible. As a full grown man Conan seems to have lived an almost carefree existence, fighting and wenching his way through life, though we discover thoughts of avenging his father are never far from his mind. Conan repeatedly pitches himself into situations where the odds were always greatly stacked against him. 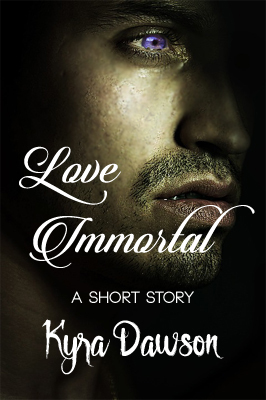 He really wholeheartedly embraces his mantra, “I live, I love, I slay and I am content.” Having no real ties to family he has a wreckless, devil may care attitude, wandering the land and seas as both thief and pirate, liberating the oppressed with an almost Robin Hood-esque flair until a chance opportunity for vengeance arises. There isn’t a whole lot of dialogue in the film though there is a lot of grunting from Conan and a ton of battle cries from his many and diverse adversaries. The violent action sequences are plenty and at times the noise from clashing swords and the bashing of bodies and skulls is mind numbing and overwhelming. But keep in mind this is a sword and sorcery movie so that is what you came to see and hear. And then there is the sorcery. Most of it is understated and part of the movie’s mythology. There’s magic tied to the Mask of Acheron and Marique (Rose McGowan) is so obviously a sorceress of some skill, while Khalar Zym (Stephen Lang) wants to practice necromancy and has been waiting 20 years for his chance. And let’s not forget Tamara’s (Rachel Nichols) pure blood that has the power to unlock the ancient mask. The one thing that was pervasive in my mind was that though Momoa made a very intimidating Conan —he was extremely intimidating in Game of Thrones as Khal Drogo which made him perfect for this role— he wasn’t as awe inspiring and colossal as his predecessor in the original Conan movies. Though Momoa is impressive and can carry this film, his screen presence just didn’t possess that same overwhelmingly imposing quality as Arnold’s Conan did. Most likely this is due only to the fact that Arnold was Mr. Universe before he was Conan and no one had seen a man as hulking as Arnold was at that time. And maybe it’s simply due to the fact that I was an impressionable pre-tween who was boggled by the sheer size of Arnold and that alone made a lasting and indelible mark on my psyche that is impossible to excise. Thankfully though Momoa didn’t try and do an Arnold impersonation. If he did he would have failed horribly. 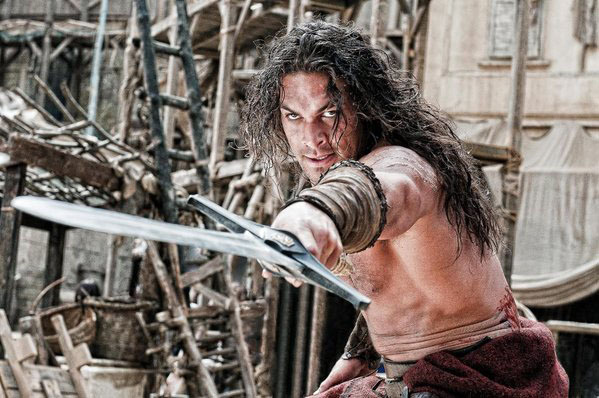 Instead Momoa brought a different kind of Conan to the screen, one who had a swagger and more appeal for the ladies, smart remarks and quick wit for a barbarian, and a brooding anger always simmering just below the surface. His scar fit right in with his barbarian persona and his scowl is more menacing than any I’ve ever seen. 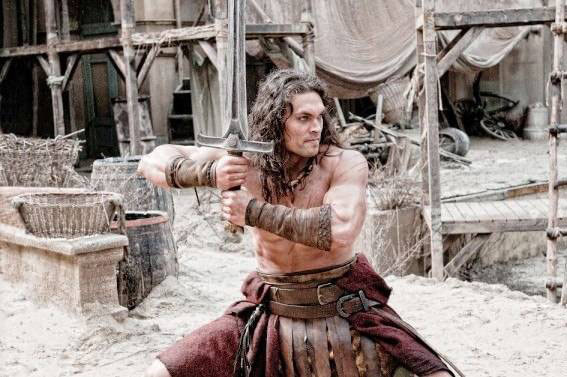 Admittedly Momoa cut a fine figure when he did his Conan the hero money shots and he wielded his sword with a confidence, dexterity and skill as only a true warrior could. 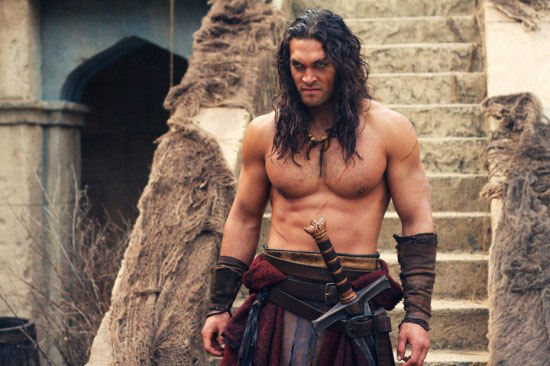 Casting Jason Momoa as the iconic Cimmerian was wisely fortuitous as it does seem like it was inevitable that he play Conan. Leo Howard’s performance was definitely riveting and one of my favorites in the film. Rachel Nichols as Tamara was a refreshing spitfire who I could see Conan falling for. Stephen Lang as Khalar Zym wasn’t as over the top of a villain as he usually is though he did manage the role with his usual finesse. 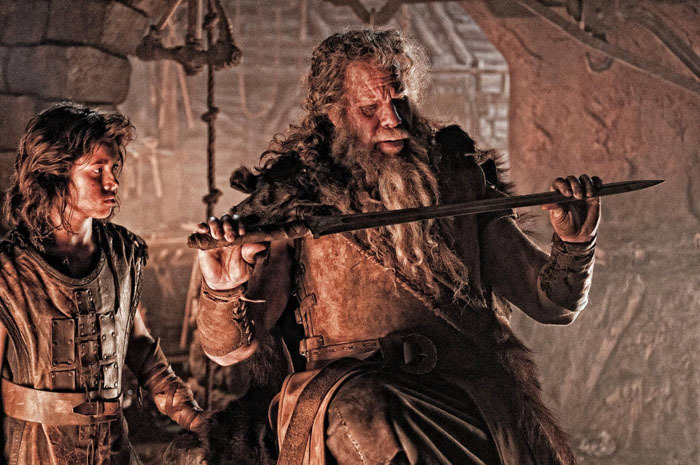 Ron Perlman as Corin was the epitome of the stoic, wise and revered warrior, leader and affectionate father. Rose McGowan as Marique was the unexpected surprise of the film playing an eerie, creepy and evil villainess with a macabre efficacy, vamping around half naked with a pronounced receding hairline and almost overshadowing Lang as Conan’s nemesis. Marcus Nispel has a music video background and I found his style of filming quite interesting. The battle sequences were very fast paced and full throttle while the quieter moments were handled with a sparseness quite fitting to a movie like this. The story was quite a departure from the original movie, so much so that one could say the new Conan lore harkens back to the books. There was some homage paid to the original film but it was obvious right from the get go that this wasn’t a remake of an original but a new franchise with a familiar character. Though it was mostly fast paced there were moments where I felt my senses being dulled because the movie seemed at times like one long endless battle. The score when you could hear it was perfect for the film hinting at a distant time and a distant land where magic and barbarians could have lived, loved, slayed and been content. The sounds of battle, violence and Marique’s finger nails scraping against stone were jarring and overwhelming to the senses but more than suitable for this fare. The 3D didn’t seem to make much of a difference and I could have done without it. The landscapes were dark and stark if not quite epic while the effects were very graphic. There was nothing mind boggling really and the standout scene for me was the fight with the sand warriors. Obviously this film was made with fans of the cult classic in mind to a certain extent, though rigorous adherence to the original went out the window for the most part. Fans of the books will be pleased and most viewers will unavoidably compare this new Conan to the old Conan. Mostly this was a film that was made for boys between the ages of 15 to 25 who like role playing video games filled with mayhem and carnage, or anyone who is a fan of blood and battles, swords and sorcery movies. 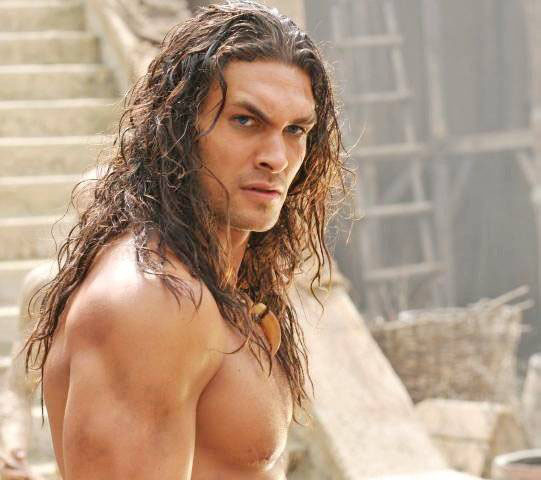 Overall you have to give Jason Momoa credit. 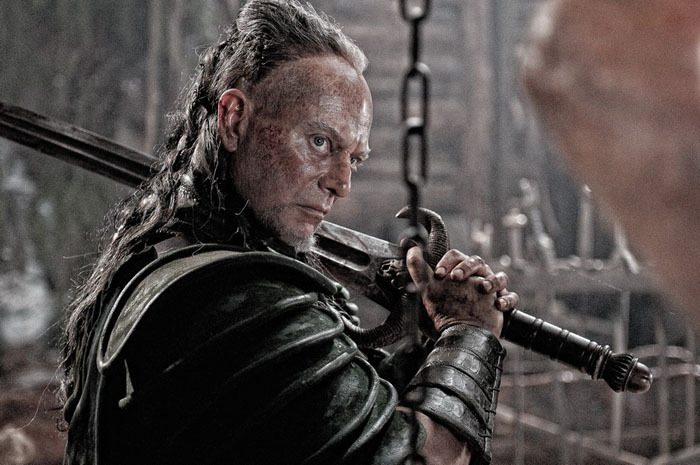 He was very brave to take on this role did his best to fill some titan sized barbarian boots. Whenever a remake is done of a cult classic that has such an archetypal, legendary and iconic character emblazoned in everyone’s mind, anything that comes after will unfortunately pale in comparison. While Conan the Barbarian was definitely not the best the film of the summer, it certainly wasn’t the worst either. And while Momoa didn’t erase the memory of Arnold from our consciousness, he did manage to put a fresh take on an old story and give a fresh face to a well known Cimmerian warrior. Conan the Barbarian gets a 6.5 out of 10.
adventure, Arnold Schwarzenegger, barbarian, battle, Buzz!, Conan, Conan the Barbarian, entertainment, Fantasy, film, Jason Momoa, Leo Howard, magic, movie reviews, movies, quests, Rachel Nichols, Random, reboot, remake, reviews, Ron Perlman, Rose McGowan, Stephen Lang, swords and sorcery, warrior. Bookmark.